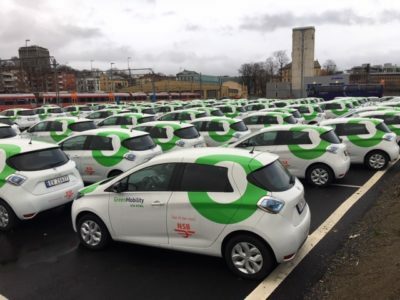 Scores of identical small electric cars have been neatly parked for the past week or so on property owned by state railway NSB in Oslo. They’re ready to be shared among Oslo residents who’ll soon be able to borrow them when needed, as NSB breaks into a new market that can compete with taxis and discourage private car ownership. Promoted as Din Bybil (Your City Car), the new electric car-sharing program is part of a franchise agreement between NSB and the Danish Green Mobility venture, which operates 400 electric cars in Copenhagen. NSB is bringing the program to Oslo, which will allow users to register on an app, find a car and unlock it with the app, rather like how the city’s popular bike sharing program has worked for several years. The cars can be found, driven and then parked anywhere within Oslo’s Ring 3 (outer beltway) area, as long as they’re parked legally with no time limits on them. DN reported that NSB also plans to establish “hotspots” around town where several of the electric cars can be parked together. An operating team will take care of maintenance and battery charging, while drivers using the cars will only pay for usage, with the price model set at NOK 5 per minute, NOK 750 (USD 89) for a 24-hour period or 20 hours a month for NOK 1,499. That’s not exactly cheap, since some conventional cars can be rented for even less and a 20-minute ride will cost NOK 100. That’s much cheaper than a taxi, however, and the program can provide many of the advantages of having a car without all the other high costs attached to that. “I’m certain this can replace some taxi rides, especially if you need to get to music lessons with a large instrument once a week, for example,” Dyb Løvold told DN. The new car-sharing program is mostly aimed at furthering efforts to cut back on private car use in Oslo, which in turn has ambitions of becoming a zero-emission city. The car-sharing idea isn’t new, with even Norway’s pioneering electric “Think” cars trying to establish a similar program when car batteries were still short-range and Think lacked financing. They were too far ahead of their time, but now, nearly 20 years later, NSB seems confident in launching a new effort. Green Mobility’s program in Copenhagen had around 34,500 users at the beginning of October, many of them young people who don’t want to tie up what money they have in either owning or leasing a car that likely would just be parked most of the time. “They want access to mobility when they need it, and they only want to pay for the time they actually use the car,” Green Mobility founder Henrik Isaksen told newspaper Berlingske Tidende. Dyb Løvold said NSB is expecting to profit from its franchise operation from 2020. NSB has leased 250 cars for the first phase of the rollout and hopes to acquire 10,000 active users in the course of 2019. “We want to make this fun to use, and then optimize on that later,” he told DN.